We recently had to do something with our overgrown fitzers on the corner of our front yard. We hired someone to bonsai them for us...unfortunately, we lost the one in the middle. What to do now??? 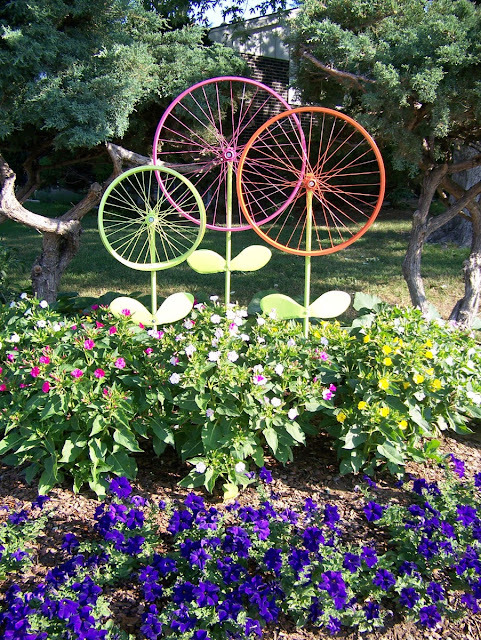 Well I love bicycle wheels and the thought came to mind that I could make giant flowers out of them. So I explained my idea to hubby, Ron, who put the mechanics to the idea and this is what we did. So many people have stopped to take pictures and comment that we decided to make some to sell. 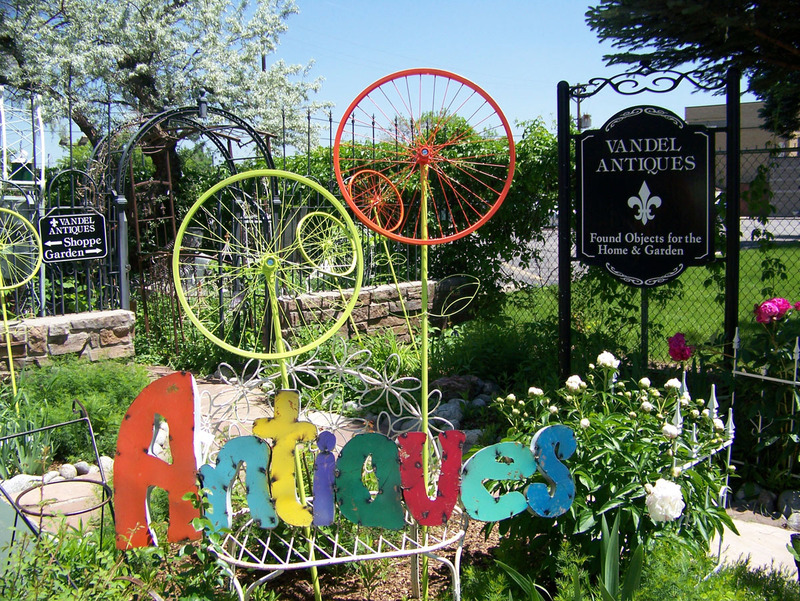 They are now available for purchase at Vandel Antiques in downtown old Littleton. It was a neighbor who came by and said, "Hey! I like your steel magnolias!" So the credit for the names goes to him. You can get them in many variations and colors. Red, white and blue ones were available for the Fourth of July and Americana decorators. 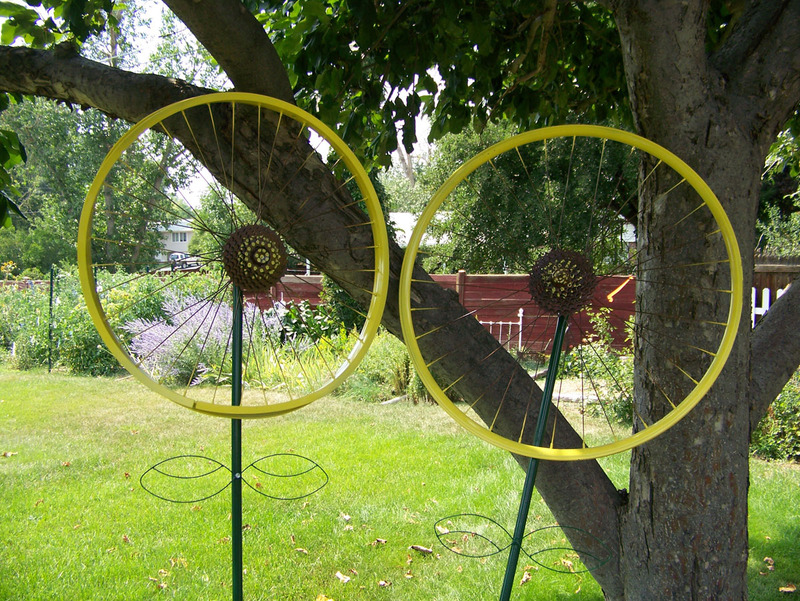 We also make sunflowers, which have been very popular. If you, don't see what color you have in mind, just tell Vandel's the color and size you want and we can make it special just for you. I would love to purchase too but I'm in WA do you ship? Sorry - we do not ship. Thanks for asking. Hi, I work as an activity coordinator at an assisted living community. We are in a first impression landscape contest. I would like to cover our lawn with these flowers. How are they attached to the stem? 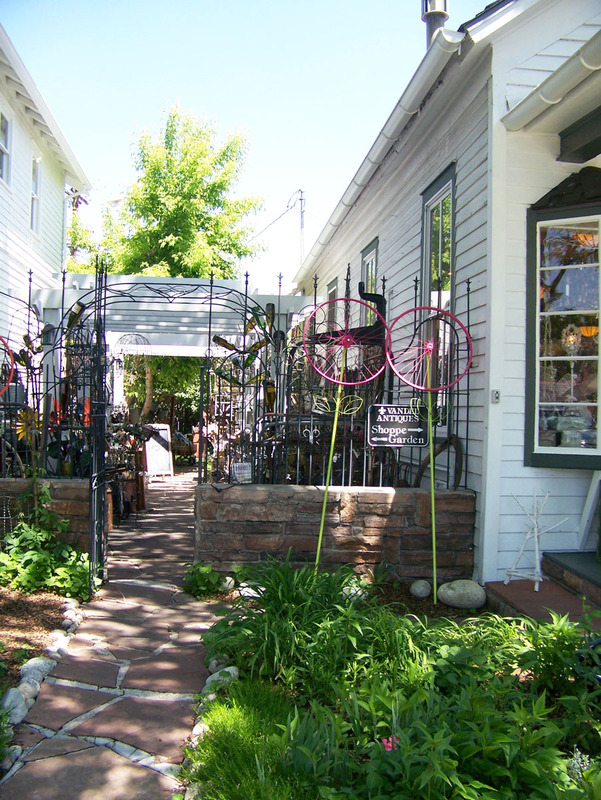 Maybe before you "take your bike to the junk yard " you take it to a bike reclaimation place and the bike and or parts are Reused to ( supprise ) a BIKE! This is a fun and friendly post about reusing and recycling old parts to make something lovely. I really don't think your comment is called for. 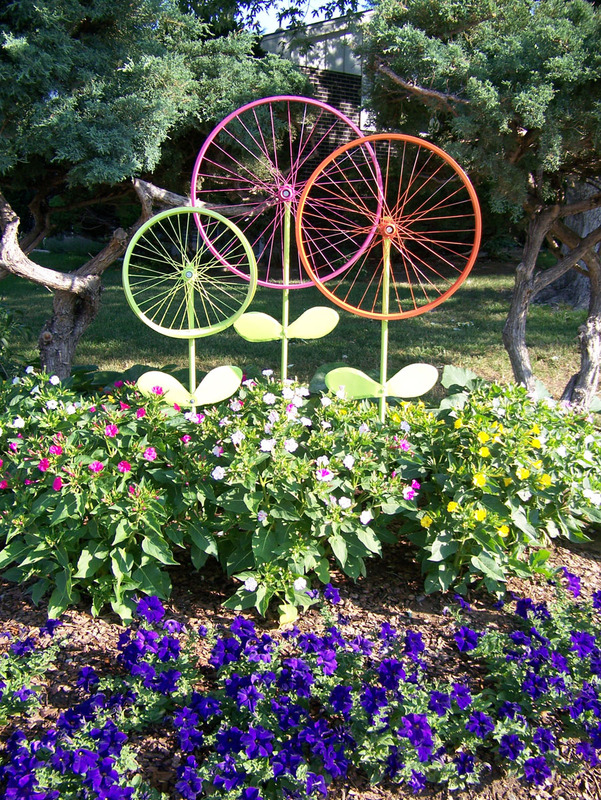 Not all old bikes are reclaimable, and many would consider a charming garden ornament a better use than a fix up. It is just a matter of personal opinion. thanks and peace. Awww come on. That comment was just fine. Yours however was uncalled for. What is the stem and leaves made out of? They are super cute! We are currently working on directions for making these. We will let you know on this blog when it is available. Thanks to everyone for your interest! Please post a link on here when you get the How To directions on making these works of art! I will be checking back just to find out! Thanks! Where can I find the instructions to make these? So cute! Almost a year later and still no instructions. WOW afraid someone might make them and cost you a few bucks? I am so sorry everyone. You will notice that I have not been here for over a year due to a family illness. It is still on my list, but I can make no promises now. I have been saving wheels to do this. I'm sorry I can't afford to buy yours. I live on the coast so these kind of 'Flowers" will grow great!. Thank you for this idea. I have lost someone and dealt with family illness this year too. I am so sorry. Blessing to you and your family. Also, being on the NC coast, we have a Lot of wind here. I'm going to use painted PVC pipe for stability. Little stumped on the leaves, but I like the coat hanger idea. I used an old broom/mop handle for the stem, I drilled a hole and used a washer on both sides of the wheel with a nut and bolt. then I used wire hangers to mimick the leaves. I also tried cutting the shape out of plastic bottles and srewing the pedals on after I painted them. Works great either way ! Enjoy! Milk jugs make perfect leaves once spray painted green. I made them when I made my tulips from pop cans on a dowel. I'm spray painting the wheels right now. Going to use conduit as the stem and old plastic fan blades for the.leaves. These are beautiful! Can you send directions on how you attached the stem to the wheel? Also, what did you make the leaves out of? Thanks! I am so sorry Jennifer. You will notice that I have not been here for over a year due to a family illness. It is still on my list, but I can make no promises now. Love to hear from my readers! Littleton, Colorado, United States Hi - I’m Muriel, also known as, The Hanky Dress Lady” in my hometown of Littleton. I invented the concept of folding vintage hankies in an origami fashion to create these cute little dresses. I’ve made hundreds of them since early 2007.